All sections of the RDUA application must be completed. Incomplete RDUA forms cannot be processed. 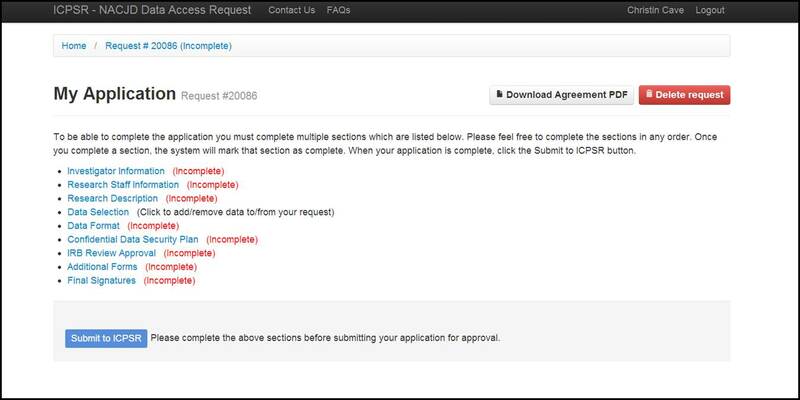 Below are descriptions of the application sections. Investigator Information. The Primary Investigator of a research project must hold a PhD or other terminal degree, and hold a faculty position at a university or research position at a research institution. Research Staff Information. Include name, email address, and computer(s) for all students, staff, or researchers at the same institution who will have access to the data and work on the research project. Research Description. This should describe why restricted-access data are needed and proposed outcomes of the data analysis (e.g., conference presentation, graduate thesis/dissertation, journal article). Data Selection. Select all studies needed for analysis. Data Format. Most data are available in Stata, Tab Delimited File, SAS, or SPSS. Rank the preferred formats. Confidential Data Security Plan. This should describe how researchers plan to protect the data from physical and virtual theft. Additional Forms. For all NIJ-sponsored research, applicants must complete, sign, and upload a Privacy Certificate. Studies sponsored by BJS are excluded from this requirement (For a list of exempted studies: Studies not Requiring the NIJ Privacy Certificate). Final Signatures. The request must be signed by the Investigator with a permanent faculty appointment and by a representative of the researcher's institution. The Institutional Representative is an individual who has been delegated the authority to enter into legal contracts and agreements. This can be a VP for Research, President, Provost, or someone from the central administration. This should not be a Dean or a Department Chair unless specific written delegation of authority exists. Confidentiality Pledges. (Not shown in screenshot.) The Investigator and any Research Staff on the application will be prompted to electronically sign this section after the Agreement has been approved by NACJD.